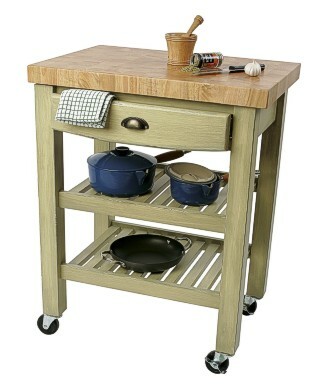 Coloured trolley featuring an antique sage green finish with a natural end grain hevea worktop, a large full width drawer and two slatted shelves. Standing on four wheels, two of which are lockable, its size is 69 1/2 x 50 x 89 1/2 cm high (27 1/4 by 19 3/4 by 35 1/4 inches approx) and it is made from eco-friendly hevea hardwood. This trolley is delivered fully assembled.